Pen & Sword Military, 9781781590317, 256pp. 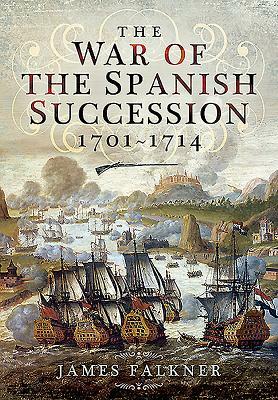 The War of the Spanish Succession, fought between 1701 and 1714 to decide who should inherit the Spanish throne, was a conflict on an unprecedented scale, stretching across most of western Europe, the high seas and the Americas. Yet this major subject is not well known and is little understood. That is why the publication of James Falkner's absorbing new study is so timely and important. In a clear and perceptive narrative he describes and analyses the complex political maneuvers and a series of military campaigns which also involved the threat posed by Ottoman Turks in the east and Sweden and Russia in the north. Fighting took place not just in Europe but in the Americas and Canada, and on the high seas. All European powers, large and small, were involved France, Spain, Great Britain, Holland, Austria and Portugal were the major players. an overview of the entire conflict... fills the gap in a book that brings the entire war to your finger tips. The author has a solid grasp of the history and reports it in a well done no-nonsense style without any hint of bias. I find this refreshing in a book about this war. Most of the books I have read on the subject have a definite English bias, at least in the amount of information about each side in the war. So thank you Mr. Falkner, and Casemate, for this book. It brings to life the war and its battles, and campaigns, and is a great addition to anyone's library.